From I-10 West Toward New Orleans, cross the Crescent City Connection to the Westbank, take General Degaulle East Exit. Continue east on General Degaulle for 3 miles. Cross the Intracoastal Bridge and take a left on Woodland Highway (LA 406). 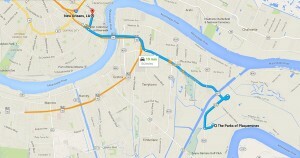 Travel approximately 2 miles, and The Parks of Plaquemines is on the left. From US 90 EAST, exit General Degaulle, head East on General Degaulle for 3 miles. Cross the Intracoastal Bridge and take a left on Woodland Highway (LA 406). Travel approximately 2 miles and The Parks of Plaquemines is on the left.